The letter 'C' is displayed in three different sizes using the sprite font system. Demonstrates how to display text using the sprite font system. Demonstrates the effect on quality of enlarging a sprite font. 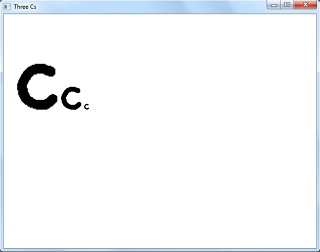 The letter 'C' is displayed in three different sizes using the DirectX font system. 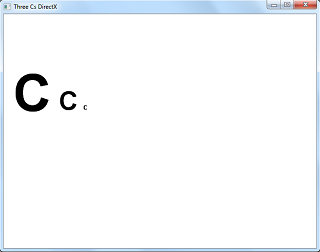 Demonstrates how to display text using the DirectX font system. Demonstrates the effect on quality of enlarging a DirectX font. Text is displayed using different fonts, colors and styles. Pressing a key switches the display between DirectX fonts and sprite fonts. The current frames-per-second is displayed in the lower right corner of the screen. Demonstrates how to display text using both sprite fonts and DirectX fonts. Demonstrates the different display effects available for each font type. The performance difference between the two font system is compared.